The job cuts also mean two long-running weekend shows are gone, Cadillac Jack’s “Brunch with the Beatles” and, especially sadly, Cade’s “Elvis & Friends,” which had been a Philadelphia radio staple since 1978. Out in Bala, where WOGL will be joining the former Beasley stations, there were still more job cuts as CBS prepares to consolidate its promotion departments: WTDY (96.5) promotions director Kristen Stoltz is out, and so is night jock Jennifer Reed at WXTU (92.5). Will the cuts help make the impending CBS Radio merger into Entercom any more successful? Perhaps for the accountants – but it’s hard to argue that a WOGL without Cadillac Jack and Ron Cade is a better station for Philadelphia’s loyal listeners, isn’t it? *It’s hard to believe that it’s been more than 19 years since we pulled up roots from New England, but last week at least gave us the chance to spend some quality time in our old stomping grounds. And what a joy it was to stop in and see some friends who are doing low-power FM in ways that ought to make the movement proud. You’ll see WBNH (105.1 Bedford, NEW HAMPSHIRE) in more detail in an upcoming Tower Site of the Week a few months down the road…and when you do, you’ll see how our friend (and fellow Western New Yorker) Harry Kozlowski is working with the community access channel and town leadership in that Manchester suburb to provide something much more than just a loop of music to fill time between occasional emergency announcements. And then there’s Haverhill, MASSACHUSETTS, where Tim Coco’s many years of work to bring local radio back to that struggling city are finally paying off. On Wednesday, Tim and his crew from WHAV.net filled a banquet hall to honor Haverhill’s radio legacy and raise money for the impending FM launch of WHAV-LP (97.9). *There’s now a date for Rush Limbaugh’s move to his new Philadelphia home, Merlin Media’s WWIQ (106.9 Camden NJ). He’ll switch stations two weeks from today, on Monday, June 25 – and when he does, his old slot on CBS Radio’s WPHT (1210 Philadelphia) will be filled by a live clearance of WPHT’s star talk host, Michael Smerconish. Replacing Smerconish in afternoon drive on WPHT will be the duo of longtime Philly talk host Steve Martorano and sports writer Buzz Bissinger. This time around, WBZ says the decision to leave, and to leave immediately, was entirely LeVeille’s. At age 57, with a newly-purchased summer home in Maine, LeVeille says he’s ready to settle down there year-round. At least for now, WBZ management seems eager to dispel any idea that LeVeille’s departure will open the door to syndicated programming overnight. After Steve’s final signoff early Friday morning, WBZ says the weekday overnight shifts will be filled on a rotating basis by interim hosts (presumably including weekender Jordan Rich and frequent LeVeille fill-ins Morgan White, Jr. and Bradley Jay) while a search is underway for a permanent successor. *Down the dial, we now know where Michele McPhee’s next radio stop will be: right back at Entercom talker WRKO (680 Boston), where she had a short run last year before moving over to WCVB-TV (Channel 5). 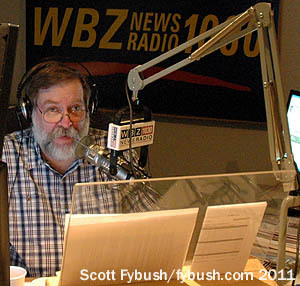 McPhee, whose experience also includes a long run as a crime reporter at the Boston Herald and a talk stint at WTKK, starts today in the 11 AM-3 PM slot on WRKO, where she displaces two hours of Laura Ingraham’s syndicated show and the 1-3 PM show that had been hosted by Jen Brien. *It’s been nearly twenty years since General Electric sold off its NBC Radio division, dismantling what had once been arguably the most important radio station group in the country. When Walt Disney hands off the keys to much of ABC Radio to Citadel today, it will mark the end – or at least a major transformation – of a station group that had an equally large impact on American radio. Unlike the NBC sale in 1988, which marked the effective end of the NBC Radio Network as an independent entity and the demise of the WNBC call letters on NEW YORK radio, the sale of ABC Radio will bring with it almost no immediate changes as far as listeners are concerned. In part, that’s a reflection of the independence ABC’s radio properties long maintained from their sister TV operation. WABC (770) and WPLJ (95.5) operate from studios at 2 Penn Plaza, many blocks from the ABC Radio newsroom at 125 West End Avenue, which is itself a long hike from the Columbus Circle headquarters of ABC television and WABC-TV. As best we can tell, there are no immediate programming or staffing changes in the offing at WABC or WPLJ, the only ABC Radio properties in the northeast, and indeed, the most obvious change for the now-Citadel staffers at those stations is that they’ve lost the Disney theme park “silver passes” they enjoyed as Disney employees. *Elsewhere in New York, Cumulus has taken the next step toward moving WFAS-FM (103.9) closer to the lucrative New York City market. The station officially changed city of license last week to Bronxville from its longtime home of White Plains. For now, there’s no change in the station’s facilities – its transmitter remains at its longtime home in Greenburgh, where the station’s studios and sister station WFAS (1230 White Plains) are located as well – but we’d expect to see an application filed sooner or later to move 103.9 down to a transmitter site in southern Westchester or the Bronx. WYSL (1040 Avon) marked its 20th anniversary back in January, but owner and founder Bob Savage (one of the “good guy” independent broadcasters we so admire in this column) sensibly waited until a beautiful sunny Sunday afternoon in June to celebrate the milestone. It’s rare indeed these days to see a standalone AM survive, thrive and even grow (WYSL’s gone from a 500-watt daytimer to a big 20 kW signal in its two decades), and here’s wishing Bob, and the other owners like him in the region, continued success. *We’ll make CANADA our next stop, as we assess the fallout of the CRTC’s decision to approve CTVglobemedia’s acquisition of CHUM Ltd., albeit with one enormous condition. CTV knew it would have to divest some of CHUM’s nationwide portfolio of television stations, but it had hoped to keep CHUM’s big-market roster of Citytv outlets in Toronto, Vancouver, Calgary, Edmonton and Winnipeg and to spin the more marginal “A-Channel” stations CHUM owns in Ontario and British Columbia. Combining the City stations with CTV’s existing national network was more than the CRTC was willing to countenance under its “one-to-a-market” TV ownership policy, though, and a divided CRTC ruled late last week that if the CTV purchase of CHUM is to go forward, it will have to be without the City stations. CTV can, if it wishes, keep the “A-Channel” stations, the rationale there being that even though A-Channel’s CKVR is seen in Toronto and its CIVI is seen in Vancouver, those are actually Barrie and Victoria stations, respectively – and under Canadian regulations, those stations really do provide news and public affairs for the areas where they’re licensed. In the wake of the ruling, CTVglobemedia isn’t saying yet whether it will follow through with the C$1.4 billion acquisition of CHUM, or with the proposed C$137.5 million spinoff of the A-Channel stations to Rogers. Even without the City stations, the CHUM radio group of 34 stations and its 20 specialty cable services (plus A-Channel, if it were to stay with CTV) would combine with CTV’s existing TV, cable and print outlets to create an impressive media behemoth. There’s about to be one fewer local TV news operation in MAINE. Management announced Tuesday that it will pull the plug on local news at WB affiliate WPXT (Channel 51) and UPN affiliate WPME (Channel 35) in the Portland market. “Our Maine News,” which aired at 10 PM on both stations, will broadcast its last newscast this Friday. The Pegasus-owned duopoly dropped its Fox affiliation (on WPXT) last year, and has been struggling with the region’s poor economy since then. A 7 PM newscast launched last fall on WPXT was soon cancelled due to poor ratings, and the ratings for the 10 PM show have suffered as well. WPXT had been doing news for nearly a decade. For years, we’ve pointed to WICC (600) in Bridgeport, CONNECTICUT as an example of full-service radio at its best – music, news and talk all combined to create a top-rated, locally-responsive AM radio station. As of this morning (Monday), that’s history. WICC eliminated its weekday music as part of a station overhaul that includes new sounders and the station’s first jingles in nearly a decade. John LaBarca stays in mornings with Tim Quinn, but now it’s purely a news/talk block, followed by an hour of talk with Quinn at 9 and two hours of the syndicated Neal Boortz show from 10 until noon, replacing the Terry Michaels midday show (Michaels has left the station, we’re told, but will do fill-in work at other Cumulus stations in the region) Chris Conley will still do an hour of news at noon, but now that’s followed by the syndicated Clark Howard show from 1 until 4. Fred Ebert remains on the schedule from 4-7 PM, followed by Yankees baseball or Laura Ingraham’s syndicated show. We’ll be sorry to see WICC turn into a more typical 21st century medium-market AM station; we still think there’s room for a full-service format in this day and age. The big news this week comes from the Granite State, where WNDS (Channel 50) in Derry has returned to independent programming after would-be station buyer Global Shopping Network reportedly missed a payment on the station. As we reported last week here in NERW, Global is having serious financial troubles, and it appears that WNDS’s owner, CTV of Derry, isn’t willing to sit by and wait for things to straighten out. “Star Trek” fans across eastern New England are already celebrating; WNDS was known for its Trek reruns, and they’re already back on Channel 50. What’s more, CTV has reportedly asked nearly all of WNDS’ dismissed staffers to come back to work, including weatherman Al Kaprelian, a cult favorite among WNDS viewers. We have actual news from RHODE ISLAND this week, and plenty of it, beginning with word that Citadel is adding Phil Urso’s WDGE/WDGF combo to its Providence station group. WDGE is the modern rocker on 99.7, licensed to Wakefield-Peace Dale, while WDGF is the dance station on 100.3 licensed to Middletown. Citadel entered Rhode Island earlier this year with the purchase of Tele-Media, which owned WPRO AM/FM (630/92.3), WLKW (790), and WWLI (105.1) in Providence. CONNECTICUT radio listeners could get a new urban FM, if the owners of WNEZ (910 New Britain – Hartford) have their way. They’re talking about buying an FM in the market if they can afford one, although NERW wonders what they’ll find available in this era of mega-opoly, when almost all of Hartford’s FMs belong to either SFX or ARS. In the meantime, “910 Jamz” carries on with urban on AM.